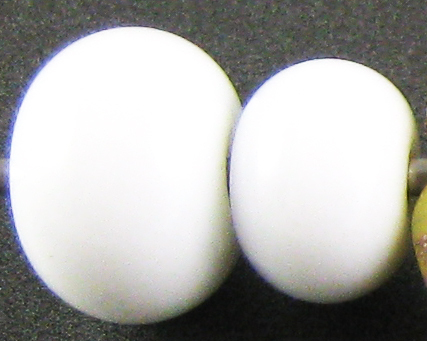 Reichenbach White (RL1200) is an opaque white glass that loses its opacity when used in thin layers. It's also a colour with compatibility challenges, because I did not manage in any of my testing to find a single colour that it does not crack with. The batch of it that I had is not compatible with Effetre Black, CiM Tuxedo, Double Helix Zephyr, or any of the other colours I've tried it with in these test beads. It's not very interesting reaction-wise apart from some pretty fuming with silver, and it's easily four times the price of Effetre White. You can make up your own mind, but I'll pass on more. I did make and photograph these test beads, though, so I may as well show them to you. Reducing this colour does not change it. Like Effetre White and CiM Peace, Reichenbach White fumes a pretty colour of yellow when used with silver. It's not evident in the picture, but the bead on the right, where I encased the silvered Reichenbach White, cracked. It cracked along the mandrel line, so at first I thought maybe it was a viscosity problem between the white and the clear layer. 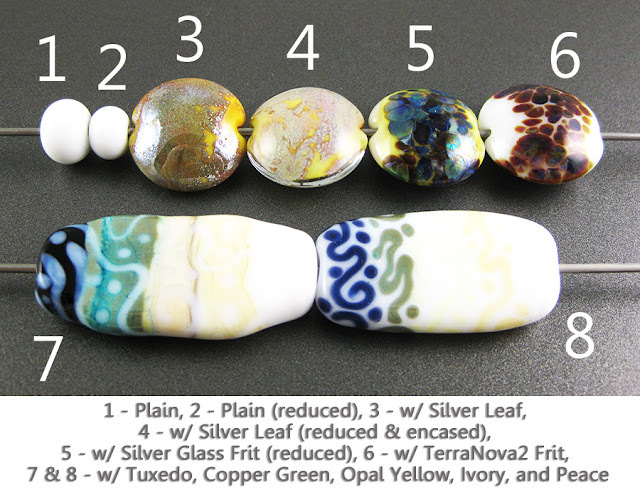 But then, a couple of weeks after I made these beads (and after my glass review article had been submitted to Glass Bead Evolution), I noticed that every single bead I made with this White and at least one other colour had cracked. To be fair, I didn't try it with very many colours -- just the ones seen here plus some beads I made with CiM Tuxedo and Effetre Black -- but every single one of the beads where Reichenbach White was not all by itself had tiny hair-thin cracks surrounding the other colour details. 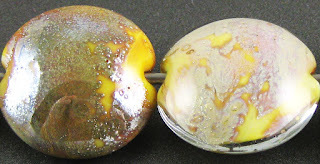 The bead where I used silver with this colour but did not encase it was a survivor and is actually sort of attractive, so if you have any of this colour lying around and want to use it up, single-coloured beads with silver seems like a good, safe way to do it. Silver glass reduced on this colour fumes the White a soft yellow. My TerraNova2 frit didn't do much on top of it. Neither of these test results matter much in light of the compatibility issues. Reichenbach White is not very reactive, and there is really nothing to say about it here from that perspective, however you can see how much it loses its opacity in thin layers when you look at how it behaved over Tuxedo.